Tamiya has a good range of colours for polycarbonate named PS. But sometimes a RC project demands a specific tone that is not available. What to do? Using our favourite search engine revealed that it is possible to spray other types of paint over PS-55 Flat Clear. We gave it a try and the results was excellent. We are currently working on a Tamiya Mercedes Benz DTM where the main body colour is supposed to be a bright shade of grey, almost white. The manual recommends mixing a little bit of PC-5 black into PC-1 white. The PC range of colours is long discontinued, so that was not an option. Tamiya usually releases the same car as scale model kit. The instructions for the Mercedes stated to use Tamiya AS-20 "Insignia white". Our understanding is that the AS range is a variant of the TS plastic spray range, specially formulated for model aircraft. Painting TS paint straight on Polycarbonate will not adhere properly. It may look fine at first, but over times the paint may flake off. The trick is to first paint the clear body shell with a thin coat of PS-55 flat clear. This provides a slightly rough adhesive surface for the TS (or AS) paint to stick. Before risking a semi-vintage body shell to the process, we made a test on a cut-off piece. The results were extremely promising: the AS paint adhered very well, even when bending, knocking and abusing the Polycarbonate as it would in a crash. Furthermore, the AS paint was more opaque than the standard PS-1 white so only two coats are needed for perfect covering. 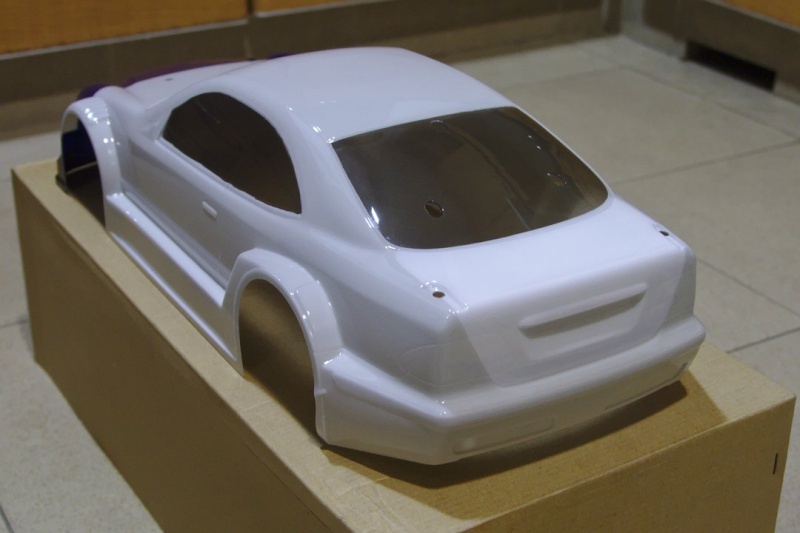 Even though the AS paint gives a flat finished, the resulting paint is still glossy on the outside as the Polycarbonate material is what gives RC car shells the shiny look. If you look at the inside of a PS painted body shell, it is flat too. The photo above shows the painted Mercedes body shell. The boot lid is PS-1 white, the main body colour AS-20. Not a big difference, but an important one to achieve a scale look of the car.